The Richmond Heights Police Department was established on December 18, 1912, with the appointment of Louis Gloeckner as the first city marshal. At that time, the City was only 20 percent of its current size and the population was about 500. Today we are part of a major metropolitan area with a population of 8,603 residents. Richmond Heights is home of Saint Louis Galleria – an upscale shopping mall that attracts more than 10 million visitors a year. As the city evolved, the police department has changed from being reactive to a pro-active department through the implementation of the “community policing philosophy” and through the utilization of modern technology to combat crime. The department moved into a new building in February of 2002. Located just east of City Hall, it shares the building with the Fire Department and Court. The department is staffed by 41 commissioned officers and an administrative secretary. Colonel Doug Schaeffler has been with the Richmond Heights Police Department since 1988 and was promoted to Chief in April, 2017. Major Craig Mueller has been with the Richmond Heights Police Department since 1996 and was promoted to Major in April, 2017. The department is divided into two divisions: Field Operations and Support Operations. Captain Rick Tes commands the Field Operations Division, which is composed of three patrol squads and the Galleria/Boulevard patrol detail. Each patrol squad consists of a sergeant (supervisor) and six patrol officers. These are the type of police officers that most people are familiar with: Uniformed officers who patrol City streets in marked police cars. The Galleria/Boulevard patrol detail consists of 3 patrol officers and a patrol sergeant, who are assigned, full-time, at the St. Louis Galleria and Boulevard retail areas. The Richmond Heights Traffic Unit is also part of the Field Operations Division and is responsible for enforcing parking and traffic violations. Captain Gerry Rohr commands the Support Operations Division, which is comprised of the Detective Bureau, P.A.C.T. and Conveyance Unit. The Detective Bureau is supervised by a Detective Sergeant and is staffed by five detectives that conduct follow up investigations and assist patrol officers with other investigations. The P.A.C.T. Unit is supervised by the Detective Sergeant and is staffed by two officers assigned to handle Police Community Relations programs such as the D.A.R.E. program, the Neighborhood Watch program and the Anti-Crime Summit. The P.A.C.T. Unit’s office is located at THE HEIGHTS, Richmond Heights Community Center and Library. Our prisoner conveyance unit merged with Maplewood, Webster Groves, Shrewsbury and Olivette to increase the efficiency of prisoner processing and housing while at the same time lowering costs. The conveyance unit is also housed in the Richmond Heights Public Safety building. The Richmond Heights Police Department has 19 vehicles in its fleet. Of them, 11 are fully marked cars (graphics on the vehicle and emergency lights on the roof); two are semi-marked (graphics, but no roof lights), 6 are unmarked (no graphics or roof lights). Included in our fleet is a Polaris ATV, conveyance van and motorcycle. The department also has specially equipped bicycles and a robot named “Officer Hairy” who drives a special police car. Hairy, who is managed by the department’s P.A.C.T. Unit, is usually assigned to special events and public relations functions. In 2003 our dispatchers joined a dispatching consortium, housed in the Richmond Heights Public Safety building. The consortium, now called ECDC (East Central Dispatch Center), dispatches calls for Richmond Heights, Webster Groves, Maplewood, Clayton, Shrewsbury and Olivette. Through this relationship with surrounding agencies, we believe that this will increase the level of service the we provide to our communities. The ECDC is supervised by director Mark Dougherty. The Richmond Heights Police Department is Internationally Accredited by the Commission on Accreditation for Law Enforcement Agencies (CALEA). 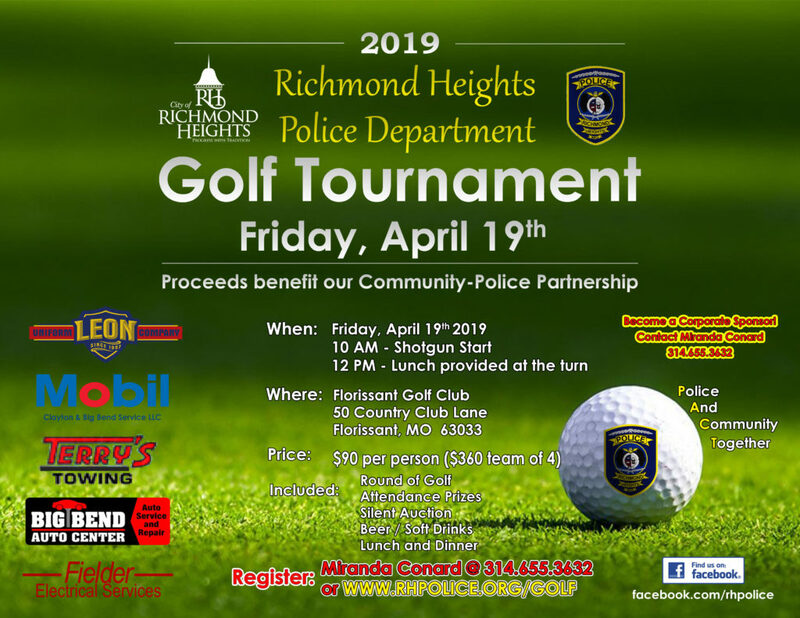 The Richmond Heights Police Department is the first police agency in the State of Missouri to require a Bachelor’s Degree at the entry level for police officer. Be able to pass a physical and psychological examination.